This review highlights the preclinical and clinical research based on the use of nano- and micro-carriers in thrombolytic drug delivery. Ischemic heart and stroke caused by thrombosis are the main causes of death in the world. Because of their inactivation in the blood, high doses of thrombolytics are administered to patients, increasing the risk of intracranial hemorrhage. Preclinical research conducted with lipid, polymer or magnetic nanoparticles loaded with thrombolytic drugs showed an enhancement of thrombolysis and a reduction of undesirable side effects. Targeted nanocarriers exhibited an increased accumulation into clot. Clinical trials were already conducted with lipid-based microbubbles combined with ultrasound and thrombolytic drug and showed thrombolysis improvement. 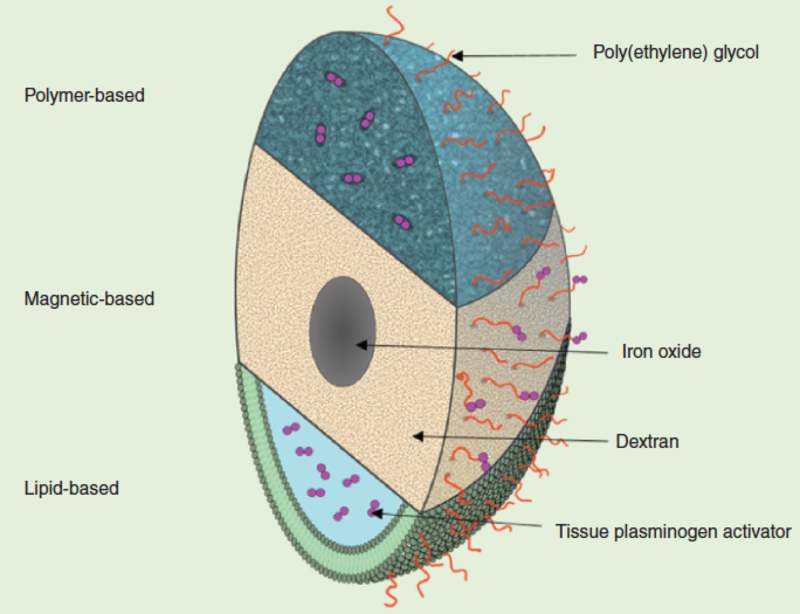 Future validation of nanosystems is awaited in clinic. This research opens new strategies for the management of thrombotic diseases. To dissolve a thrombus, thrombolytic drugs are administered, but they are rapidly inactivated in the blood. High amounts are thus injected to patients with the risk to develop intracranial hemorrhages. Nanocarriers and microbubbles have been tested in preclinical models to deliver thrombolytic drugs. These systems have the advantage to protect the drug from the degradation. In clinical trials, galactose and lipid-based microbubbles associated to ultrasound and thrombolytic drugs showed an enhancement of thrombolysis. Other systems are also expected with new drugs combined or not with endovascular intervention to treat ischemic heart or stroke.